My wife, Suchitra Rao, designed this nursery for our, now, 6 month old. The circles are wood with adhesive backing, which were ordered online through Glenna Jean Baby, then custom painted. The sheets, quilt, bumper, and pillows are from the Sweet Potato Collection. The polka dots on the storage boxes and the rings on the wall were both painted with the same custom paint. The rug, puchased from Restoration Hardware, happened to fit our color and design scheme. This is a beautiful room. The colors are perfect. I can't get over the fact that you painted the circles on the storage boxes yourself. 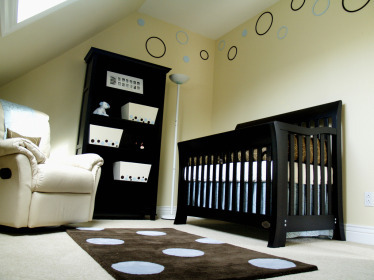 That is such a great idea to customize the nursery decor to your style. The Sweet Potato Collection is adorable and comes in such a range of colors, it's easy to find a match. Here is another nursery rug, Blue Oxygen Rug, that would complement this theme.